Missa brevis D major, KV 194 (186h) composed by Wolfgang Amadeus Mozart (1756-1791). Edited by Walter Senn. For 3 trombones. This edition: Stapled, Urtext edition. Stapled. Messen, Klassik (Masses, Classical). Set of wind parts. KV 194 (186h). 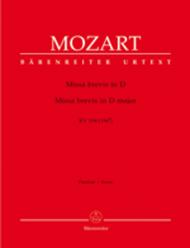 Published by Baerenreiter Verlag (BA.BA5342-65).ISBN 9790006468294. Messen, Klassik (Masses, Classical). 33 x 26 cm inches.